These small cherry like blood blister like lesions are absolutely benign and normal but many people seek treatment for cosmetic reasons. Associated lesions are called angiokeratomas which can be seen on genital skin as well. Laser treatment is highly effective in the treatment of these lesions. 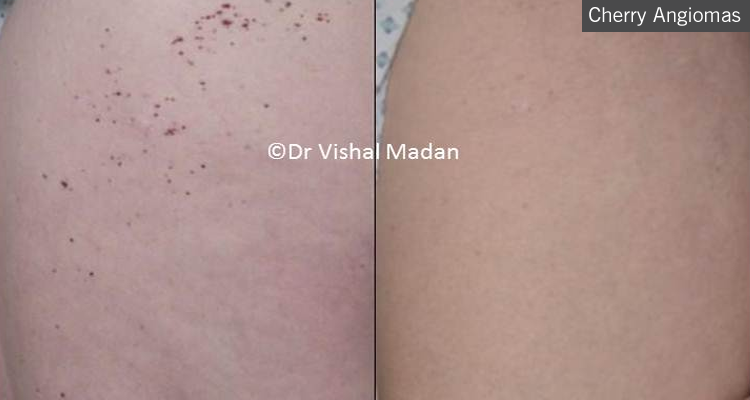 Both pulsed dye laser and Nd:Yag laser can be used for treating these lesions. Some practitioners would use freezing (cryotherapy) which can result in pigmentation problems. Such treatments should be avoided.